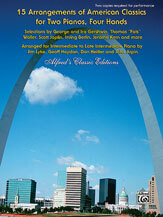 The 15 American classics in this collection have been masterfully arranged for two pianos, four hands. Titles: Ain’t Misbehavin’ (Fats Waller) * Alexander’s Ragtime Band (Irving Berlin) * America, The Beautiful (Katherine Lee Bates and Samuel A. Ward) * By Strauss (George Gershwin and Ira Gershwin) * The Easy Winners (Scott Joplin) * Everybody’s Doing It Now (Irving Berlin) * Gladiolus Rag (Scott Joplin) * I Want to be Happy (Vincent Youmans) * Look for the Silver Lining (Jerome Kern) * Medley: Yankee Doodle Boy; Over There; You’re a Grand Old Flag (George M. Cohan) * Nobody But You (George Gershwin) * Pineapple Rag (Scott Joplin) * Solace (Scott Joplin) * Swanee (George Gershwin) * When the Midnight Choo-Choo Leaves for Alabam’ (Irving Berlin). 128 pages.